More than 80,000 people will be diagnosed with Bladder Cancer this year. Here is what you need to know about Bladder Cancer Awareness Month. May is Bladder Cancer Awareness Month. And while instances of Bladder Cancer are higher in men, the number of women diagnosed each year is growing. 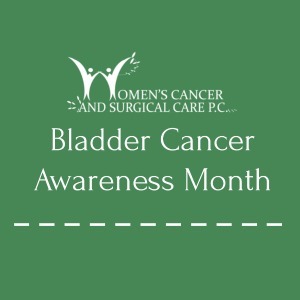 Women’s Cancer and Surgical Care wants you to have the facts about Bladder Cancer. Knowing the signs/symptoms and risk factors can help you or a loved one catch this terrible disease in its early stages. Smoking: Smoking is the greatest risk factor. Smokers get bladder cancer twice as often as people who don’t smoke. Chemical Exposure: Some chemicals used in the making of dye have been linked to bladder cancer. People who work with chemicals called aromatic amines may have higher risk. These chemicals are used in making rubber, leather, printing materials, textiles and paint products. Race: Caucasians are twice as likely to develop bladder cancer as are African Americans or Hispanics. Asians have the lowest rate of bladder cancer. Age: The risk of bladder cancer increases as you get older. Gender: While men get bladder cancer more often than women, recent statistics show an increase in the number of women being diagnosed with the disease. Unfortunately, because the symptoms of bladder cancer are similar to those of other gynecologic and urinary diseases affecting women, women may be diagnosed when their disease is at a more advanced stage. Chronic Bladder Inflammation: Urinary infections, kidney stones and bladder stones don’t cause bladder cancer, but they have been linked to it. The most common sign is blood in the urine. Though this is sometimes ignored because it is usually painless and can be sporadic. If there is blood in your urine DO NOT hesitate to see your doctor. Symptoms can include irritation when urinating, urgency, frequency and a constant need to urinate. Again, things that may be ignored or diagnosed as something else, like a urinary tract infection. At Women’s Cancer and Surgical Care we want you to be aware and knowledgeable about all cancer possibilities, so that if necessary we can battle it together. Help us spread the word during Bladder Cancer Awareness Month. This entry was posted in General, Prevention & Screening, WCSC Latest Highlights. Bookmark the permalink. The Mission of Women’s Cancer and Surgical Care is to maintain a culture of excellence by delivering to our patients the most advanced, timely, and compassionate care possible. Women’s Cancer and Surgical Care leads in providing oncology and surgical care in a multi-specialty setting.